Day one - After arrival in Moscow, our driver will bring you to Cosmos Hotel 4*. 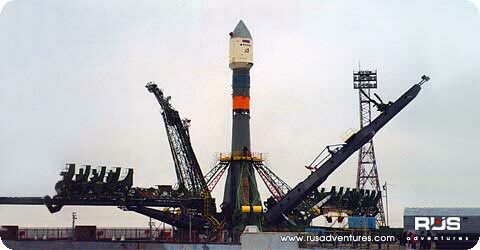 Day two - Your flight from Moscow to Baikonur departs early in the morning. Baikonur is the capital of the oldest and largest Soviet-Russian Cosmodrome (Baikonur Cosmodrome: Map and Plan). Now territory Baikonur Cosmodrome and Baikonur City Russia rents at Republic of Kazakhstan. Day three - Check out and departure day from Russia. Your guide-interpreter will accompany you to the Sheremetyevo International/Domodedovo Airport, Moscow. *Program of the Baikonur Launch Tour: Mars Express coincides with the time of launch of the Mars Express spacecraft, which takes place at 7:00pm. In case the time of the launch changes the Tour (on the Baikonur Cosmodrome) will start earlier or later than stated on the Baikonur Launch Tour Itinerary. *The price of Baikonur Launch Tour: Mars Express indicated is for a group of at least 35 people. Therefore, we ask that you please contact us to confirm the prices for individual or group tourist. RusAdventures can not ensure the exact time of a launch due to possible delays and changes in schedule that are dictated by Rosaviakosmos, as well as by weather conditions and other factors which are beyond our control. You must pay 50% of the price of Baikonur Launch Tour: Mars Express as soon as you book it. This sum should be paid not later than 45 days before the beginning of this Baikonur Launch Tour. If you cancel your reservation of the Tour during the period of between 45 and 30 days before the beginning of the Baikonur Launch Tour: Mars Express, we shall return your first payment minus a 20% penalty. We ask you to make the second payment not later than for 30 days before the beginning of this Baikonur Launch Tour. Cancellation of your participation less than 30 days prior to the beginning of Tour will lead to loss of 100% of price of Baikonur Launch Tour: Mars Express. You have to send passport information not later than 60 days before your arrival in Russia. Please, learn about other conditions and details the reservation and payment of Baikonur Launch Tour: Mars Express. The launch of the Mars Express spacecraft can be performed only during the two months of 2003. During May-June the planet Mars and Earth will approach each other at the closest distant for the last 17 years. Being at the observation site of Baikonur Cosmodrome (Kazakhstan), you can become a witness of launch Soyuz rocket with Fregat booster, which will deliver the Mars Express on the Red Planet by the end of the 2003 year. Join our Baikonur Launch Tour: Mars Express! Compare our prices to other offers of Baikonur Launch Tour: Mars Express. If you see prices lower than ours - all the same our prices will be below. © 2001-2011 Proton Management Ltd. All rights reserved.